We are offering Hydraulic Hand Stacker to our clients. These are hard chromed, polished pistons that are resistant to rust, scratches and wear. These have double sealed high-pressure polyurethane oil seals, to ensure the long life of the hydraulic system. These are ergonomically designed steering handle to prevent leakage. These are to reduce pulling power and minimize operator fatigue. Light and compact Construction. For easy operating from all angles. Stacker's fork length & width can be designed as per customer's requirement. Stacker's are available in standard, Stainless steel, the Galvanized version with or without the braking facility. 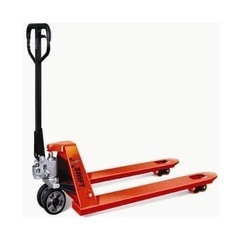 Pallet trucks that have high load bearing capacity and require minimum maintenance. These are equipped with Nylon roller wheels and fork size of 1130 x 520 (L X W). Highly easy to operate, these trucks require minimum pulling power. The pallet truck also has bushed metal to metal parts that do not require any greasing and it also has a control lever with three-positions of up, neutral and down. 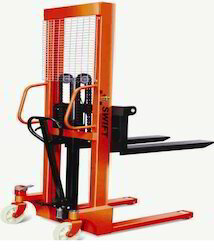 Pallet truck is widely used in various industries to lift loads.